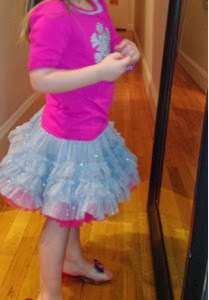 It's hard to tell from my photo or the Costco photo on-line, but both the skirt and the applique snowflake on the top are sparkly, and the skirt is made from many layers of chiffon, like a tutu. I spent $15.99 for the outfit at the West Nashville Costco and $8.25 for a shipping envelope and postage to New York. I had to wait in line at the West Nashville Post Office for about 20 minutes. The outfit sells at Costco.com for $17.99, with free standard shipping. I could have saved time and money with Costco.com. Looks like they are almost sold out, so if you want this, buy it soon.